Thread: So The West Coast Is Crap; What Alternative For Roscoff - Pamplona? Jaysus, Rasher, tell us the news? We flipped the direction of our trip, ultimately traveling home northwards through France from Pyrenees to Cherbourg via west coast. For me, the 2-day ride through France almost ruined the trip. The straight boring roads were depressingly monotonous and ubiquitous. 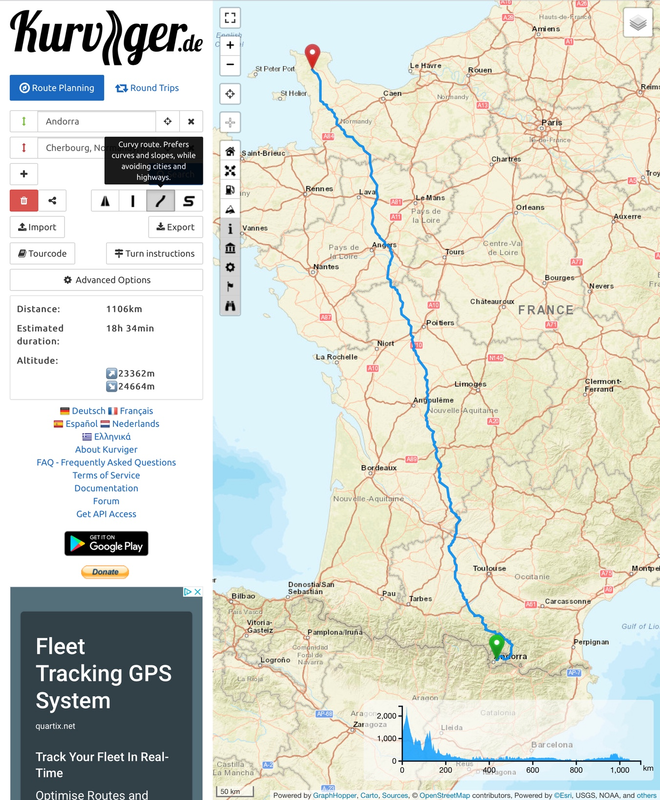 We did put more effort into creating/finding/using great roads in Spain & Portugal, but I found it very difficult to find good roads from SW France up to Cherbourg. West coast of France will be avoided in future trips. Whilst it’s certainly true that there is no guarantee that there are always ‘great roads, mate’ between A and B, let’s see what we can do to help you. You had two days to travel what was near enough the length of France. If you tell us the specific roads you took, bods will know which to avoid, whilst others might be able to suggest alternatives. Perhaps if we'd done the trip in the direction originally planned we'd have done the France slog first and then been impressed with Pyrenees/Picos/Portugal/southern Spain. Bin, no dramas or tragedies - just dull riding, particularly after the fantastic roads we'd been on for the preceding 2 weeks. Perhaps the looming end-of-the-trip was causing a depression or negative vibe which may have affected us, and the French section was simply not great, rather than crap. Basically the whole section from where the westward part on the northern side of the Pyrenees turns north - 90% dull. Maybe we were just unlucky. On your shortened holiday route, if you’d gone roughly: Auch, Bergerac, Limoges, Tours it might well have been better. From the longer holiday route you’d hoped to do (ending a the eastern end of the Pyrenees) we can see that you were determined to hit the western coast / western side of France, irrespective. If you’d have planned on roughly a diagonal line: Perpignan, Limoges, Tours and onwards to the ferry it might well have been interesting. There is a very good Michelin map 726, useful for plotting journeys A to B across a very large country, France. It strips out all the fine detail, leaving just the main roads, nicer smaller roads, the sensible link roads and shows the Bis ‘Tourist routes’, all which will avoid the motorways. Get it. Are they always ‘Great roads, mate’? No. But eventually, if you want to go A to B, within time period X, you sometimes have to compromise. That’s life. There's some amazing prehistoric cave art to be seen in France, most of it well inland from Atlantic. Would make good destination to break up the journey if doing a long haul and of course if such things are of interest. Not followed this thread in detail, whatever, we try to go to a music festival in Albi every year in early July but even if you can’t make it then, Albi is a lovely town,really worth visiting. September 2018 arriving Roscoff and stopping overnight in Rochefort en Terre (recommended by bods on here), then some place East of La Rochelle - we met a kind biker couple on the ferry who said stay with us, then Pau before heading over the Pyrenees to Zaragoza and beyond. Set your sat Nav to shortest route, not fastest time, no tolls(if it’s Nav V like mine) and you will have the time of your life. We bought the Michelin grand itinerie map recommended by Wapping which helped. I beat the eta time every day due to the fact you can make progress on these back ‘ish’ roads without silly speeds.